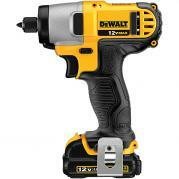 Detailed listing of our DeWalt 12 Volt Max Compact Cordless Tools. Powerful, long-lasting Lithium Batteries plus LED lights on both tools for low light visibility make this DeWalt combo kit the ideal driving and drilling solution. 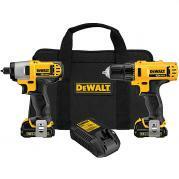 Includes Cordless 3/8" Drill, Impact Driver, 1-hour charger, two 12-Volt Max Lithium-Ion batteries, 2 bit tips and contractor storage bag. Individual tool weight with battery: 2.4 lbs. Powerful, long-lasting Lithium Batteries plus LED light ring on both tools for low light visibility make this DeWalt combo kit the ideal fastening and driving solution. 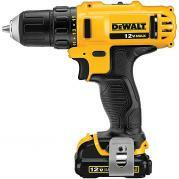 Includes Cordless Screwdriver, Impact Driver, 1-hour charger, two 12-Volt Max Lithium-Ion batteries, 2 bit tips and contractor storage bag. Compact, Lightweight and Powerful - add to it an LED light for optimal visibility and you've got the perfect cordless drill for any tool kit! 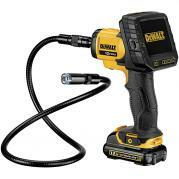 Includes Cordless Drill, 1-hour charger, two 12-Volt Max Li-Ion batteries and contractor storage bag. Tool weight with battery: 2.4 lbs. Compact, Lightweight and Powerful - add to it an LED light for optimal visibility and you've got a great cordless screwdriver for any tool kit! 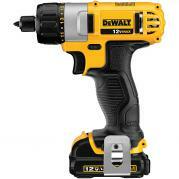 Includes Cordless Screwdriver, 1-hour charger, two 12-Volt Max Li-Ion batteries and contractor storage bag. Big Torque, Big Power in a compact size - add to it an LED light ring for optimal visibility and you've got a great cordless impact driver for any tool kit! 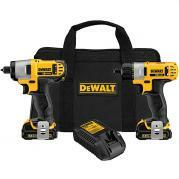 Includes Cordless Impact Driver, 1-hour charger, two 12-Volt Max Li-Ion batteries and contractor storage bag. Non-Contact, Infrared Thermometer makes is easy to read accurate temperatures form a distance and uses the same 12-Volt Max Lithium Batteries you already have! 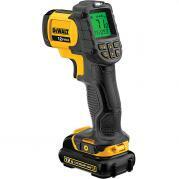 Includes Cordless IR Thermometer, 1-hour charger, and one 12-Volt Max Li-Ion battery. This indispensable Video Inspection Camera (Borescope) lets you see, capture and zoom into areas that would be impossible with any other tool and its wireless display gives you the range you go anywhere! Includes Cordless Video Inspection Camera with Remote Wireless Display, 3ft Camera Cable with LED Tip, Magnet Tip, Hook Tip, 1-hour charger, and one 12-Volt Max Li-Ion battery. 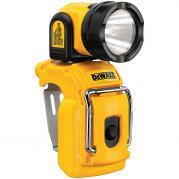 Handy LED Flashlight/Work Light with Pivoting Head uses the same DeWalt 12-Volt Max Lithium Batteries you already have! 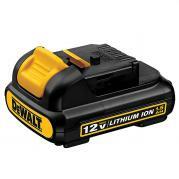 DeWalt 12-Volt Lithium-Ion Battery Pack delivers concentrated power for all your 12-Volt MAX cordless tools. 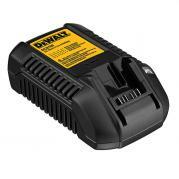 DeWalt 1-Hour Charger for 12-Volt MAX Lithium-Ion Batteries, keeps you, and your tools, going all day! Delivers rapid, 1-Hour or less, full charge for 12-Volt MAX batteries.